The sweet smell of a bakery accelerates my pulse and propels panic signals to my brain. I’m allergic to nuts. I dream of warm apple pie slices and soft, sprinkled sugar cookies. Bakery staffers usually crush those dreams with a fistful of almonds. Or cashews. “Does this cupcake have nuts in it? I’m allergic,” I typically ask the clerk at the counter. “No … it … doesn’t,” he responds slowly, thinking hard. This is not comforting. “Do you have a list of the ingredients I could look at, just to make sure?” I follow up. I leave empty-handed after each of these encounters. Until recently, I feared I would never find a bakery to sate my cravings for nut-free cupcakes and cookies. All that changed a year and a half ago. When I moved to Washington, D.C., a friend told me about the “unreal” cupcakes at Baked & Wired, a bakery and coffee shop in Georgetown. I dismissed it almost immediately, sure that this bakery would disappoint me like all of the others. But one afternoon last winter, I was in desperate need of chocolate. I took a chance on the little shop with the pink and brown sign. Inside, each pastry was adorned with a colorful handmade sign. I stepped to the back of the line, which often stretches out the door day and night. I cautiously approached the row of plump cupcakes in the front of the baking counter. Each one had a name–like the purple buttercream–frosted Uniporns and Rainhoes (a take on vanilla Funfetti cake, with embedded colored sprinkles) and Pretty Bitchin’ (golden, whipped peanut butter frosting on a dense chocolate cake). I counted at least 25 flavors in all. I asked the clerk my usual question about the cupcake ingredients. When he showed me the list I almost passed out from shock. Then he told me that the bakers take nut allergies very seriously. So seriously, in fact, that they place a nut on top of any cupcake with nuts inside of it. This is valuable because sometimes baked goods contain fatal mines of almond extract and hazelnut cream. So began my non-nutty love affair with Baked & Wired. It almost didn’t matter what the cupcakes tasted like. Almost. 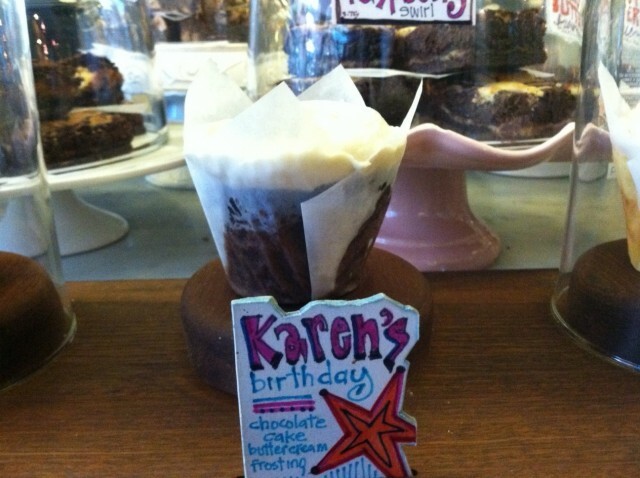 And then I took my first bite of Karen’s Birthday, a chocolate cupcake with vanilla buttercream frosting. The cake was moist and soft. But this was no mild-mannered devil’s food cake. It was a deep, serious chocolate. The frosting was smooth and buttery. It was cupcake heaven. I’ve been back at least once a week ever since. Elizabeth Weingarten is an editorial assistant at the New America Foundation in Washington, D.C.